You are a true hero. Thank you!!! Can anyone recommend a good place to source the H11F3? I’ve got a bunch of early 70’s NS LM308H I’ll build it with! Also have anyone had any experience using the Harris CA3130’s or LM709H’s in this circuit before have they? I think H11F1 should work too. I built johnk's version of this and used a H11F1 and it sounded really good, so yes it does wwork. Would an h11g1 or an h11L1 work? is not necesary 9.1 zenner? That's just a protection diode. You could always add it (if you want) in parallel to the 100uF cap, next to the CLR resistor. thank alex, in a this days I will try to build, I was waiting the arreving of H11F1, you came with this compact layout your the one! Ok, so I was crazed by this circuit for a while last year. This vero is for the second, most popular version of the pedal. I tried to make the vero version from the ‘contributions’ page here last year, but it would not work, and sadly, I got dressed down for my soldering technique. I then tried a pcb from JMK. Even though the website said it would take a while, I was still biting my nails. The pcb was supposed to come with DIP switches but did not. I could not get it to go. I then tried Fuzz Dog in the UK which shipped me the stuff as fast domestic products. Also, the ‘Dogs photos and documenation are very pro looking and confidence inspiriing. I nailed the build. Then, my spouse gifted me a pristine version 2 of the original pedal. I am happy to say the Fuzz Dog pcb sounds identical however the pots were not in the same location. 1) It’s treble forward, so, use humbuckers, and or curly cables. Strats and teles beware! 4) Use a footswich to switch into the “Forbidden’ gated mode. Hi there, NTE2370 is a PNP with built–In 4.7k bias resistors...watch the pin-out! Thanks for the info. Is version #3 the one with bass boost switch then? The 22n on the middle left seems the best place to mod. yes, it appears version 3 has the bass option, as for the mods, hopefully someone smarter will chime in! Using a pair of OP07's. Should any mods be done to the 33p compensation caps? Same question for other op amps, or is those more of a "LM308 or nothing" thing? A bit of history; There are four versions of the Expandora. V1 carried no gain switches. The circuit itself may fundamentally be very different too, but I haven't seen one up close yet to determine that. V2 was equipped with gain switches, but they were internal. V3 moved the gain switches to the exterior. These versions were all made by Bixonix in Japan. V4 was a reissue, built under licence buy Godlyke. The circuit was significantly altered where gain control is concerned, as well as switching to a more readily available opto. Gain was converted to a pot, doing away with the switches. Unfortunately, it also did away with the "Forbidden Mode", but no big deal in my book, I considered it a novelty setting. All in all, IMHO, the tone is just as attractive as the V2 and V3 units, although slightly different. The big plus that V4 has over the others is that it is much quieter. V2 and V3 are real hiss-meisters, which really put me off of them. V4 is great though. OK... the flashing VU LED's are a bit gimmicky, but you could always edit those out if so desired. The don't affect the circuit at all. The V4 schematic is here, if you wish to vero that one. I cleaned it up, and the values are all traced to my unit. I would get rid of those flashing LEDs. 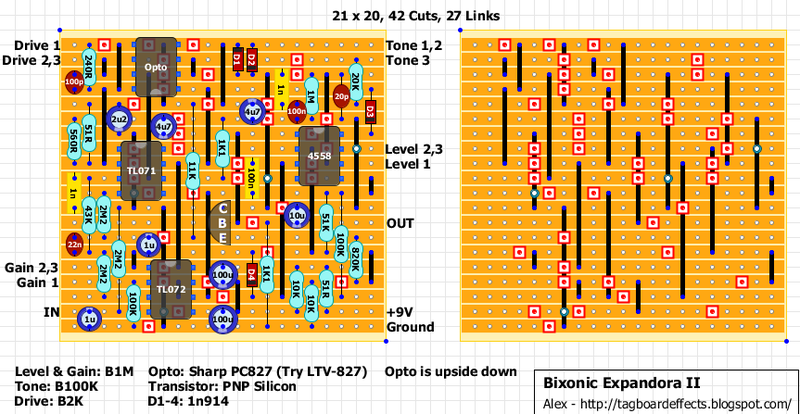 Is the LTV-827 a good substitute for the Sharp optocoupler? The LTV-827 seems to be a direct replacement for the PC-827. The LTV is made by Lite-On, while the PC is made by Sharp, but the datasheets state identical specs. On a slightly different note, I was noodling with an Expandora PCB last year (made by JMK if I recall correctly). I found a way to replace the gain switches with a pot, using a switch in series for the Forbidden mode. This opened up the circuit for a lot more texture, since with a pot all the "in between" settings can be had. Forbidden mode can be activated via footswitch. I don't have my notes in front of me at the moment, but I'll check tonight and post the setup I used. Well, I realized tonight that the build actually ended up as a gift to a friend, who now resides in Australia. But... I did take some pictures, and managed to piece together what I did. The original schematic is courtesy of JMK, I merely replaced the DIP switches with a pot, which I named "EDGE". The Forbidden mode switch is shown in series, and can be a footswitch. You can add the CODTONE gain mod as well to adjust the amount of crazy you want in Forbidden mode (not shown on the schematic). I've added a Forbidden/Edge pot version. I've removed the Bite pot cause I wasn't sure how it was going to interact. Regarding V.4, do you think is the first half of IC2 (from your schematic) that helps with the noise or could it be removed? So Edge Pot is equal to Dip switches? is the same as on version 4 Drive pot? @Alex: I think you mean IC1 (just before the LED network)? I would keep that, since it also connects to the non-invert input of IC3. There might be some interaction happening there, like a clean blend in, as well as providing signal for the comparator network. D6, Q2, IC4 and all the surrounding resistors, cap, and LED's can be deleted. Amazing!! I was looking all tis info a year ago, Dino is Expandora's guru!, in JMK (2015) schem. is 330R not 240R. I'm not sure IC1 (just before the LED network)connects to IC3... I may be missing something. @Claudio; Woah there Captain Happy!! Guru? No. I'm just a shmuck with a solder addiction. Seriously though, thanks for the kind words. As for the resistors, the DIP switches in the original switched between 560R (mid drive), 1.1K (hi drive), and around 371R (lo drive) when both switches closed (parallel resistance of the 560R and 1.1K). The way I set up the pot, at minimum the 1K and 330R create 248R, + 110R = 358R. This is lower than the original, so my mod can go a bit lower on the drive, without getting into the Forbidden territory. If you look at V4, they use a 240R, so it's all good there. As you dial up to maximum, the 330R gets dialed out as the pot wiper goes to shunt, and pegged you get 1.11K. Close enough to the original. Of course, bridging lugs 2 and 3 on the pot does shift the taper EVER so slightly, but it's not really noticeable. @Alex: Ohhh OK, gotcha. That would be IC2a. It's a voltage divider, and supplies IC3b, IC1b, and Q1 with 1/2vref. That's a keeper. IC1a connects to IC3b AND IC1b via R8 (100K), but looking at it more closely, this is all part of the vref network. I could see it being used as a buffer driver for the comparator network, but I'm not sure how it would affect the overall sound if it was removed. I would leave it in as well. Correction on the Expandora historical account; V3 was also made by Godlyke under licence. 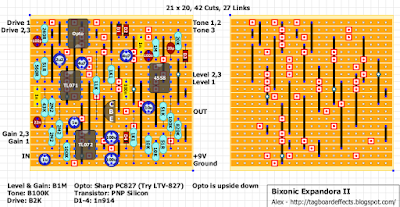 V1 and V2 were made by Bixonix. V3 also introduced the Guitar/Bass voicing switch. At the end I didn't keep IC1a. Dino, I built first board with 2 switches and I tried drive mod, I mean I removed the 1.1K form left of 560R and put a 1K Pot with 3030R between leg 2 and 3 and 120R in serial with lug 1 to board, Just beacuse I don'ty want to built version 3 board from here, is nice to sweep the pot to find a point, but I feel a little ower gain on Distortion mode than some of the demos, if I replace 1.1K from left of 560R with 1.5K or 2K it will increas the gain? Guitar/Bass voicing switch: Thanks to Dino T. for his trace of the 2000R v3 with the 3 external switches. The bass switch converts the high pass at the very end of the circuit to full range. Change the 1.1k/10uf to 11k/100n for the same low cut, and add a switchable 10uf to bring the low end back in. Well, After months of delay I finally built Expandora, is great!, I Use first schematic with bite control bridged, I found that forbbiden mode eneabled is oscilating at max gain, I read on Codetone notes that. so now I will try a few mods. Alex you can tag it as verify!